Highlights of some of the organizations that receive financial support and thousands of volunteer hours each year from Log Cabin Home and its employees! Children are one of our nation’s most valuable resources. Today’s children are tomorrow’s leaders – civic, business and social. Alarmingly, approximately 13 million American children live in poverty. Studies reveal that growing up in poverty can have an adverse psychological impact on a child. One of the adverse impacts is low self-esteem – a by-product of little or no hope for the future. Victoria Vesce and Hank, her dog, sitting with some of the gifts collected. Each child has a choice of two paths to the future. One path leads to a productive life as an asset to the community. The other path leads to a life of dependency on the community for support. Without outside help, the path of least resistance is too often the path to a life of dependency. “Toys for Tots” was founded in 1947 by the U.S. Marine Corp with the intent to motivate youngsters to grow into responsible, productive, patriotic citizens and community leaders. The U.S. Marines and “Toys for Tots” have continually grown this program and other various programs over the years. These facts coupled by our love of our community provoked Victoria Vesce (daughter of Log Cabin Founder) to head up the drive to donate to Toys for Tots. This challenge was given to our staff in each location to support the cause as individuals. 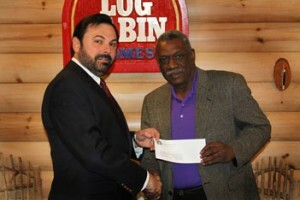 In the end, Log Cabin Employees collected several hundred toys for “Toys for Tots” during the 2012 Christmas season. It is an honor to be a part and play and active roll in the lives of the generations of today and tomorrow here in our own communities. 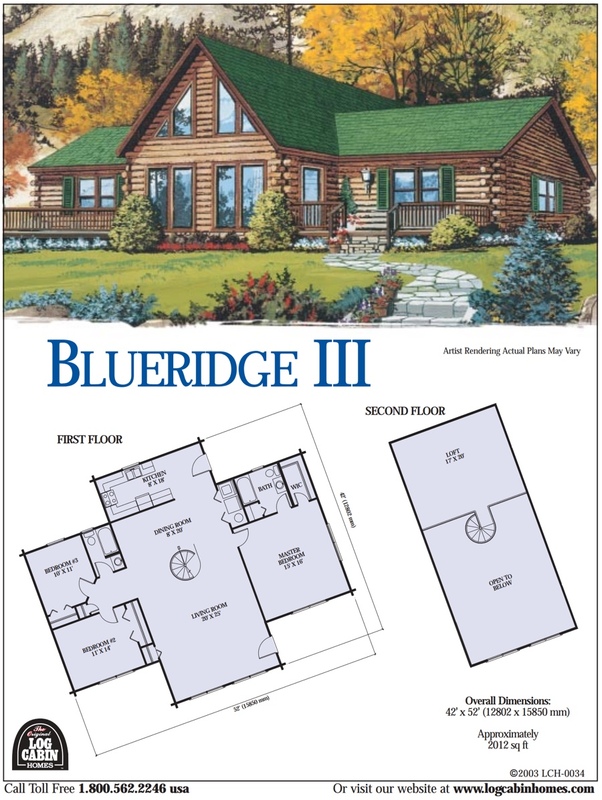 Log Cabin Homes Makes a Wish Come True! When the large limo came to the front door of the restaurant, out come a truly unique and very special family. Grandmother Patricia Davis, brothers Treasure Cobb and Shamon McNair, sister Kameisha Dickens and the guest of honor Mr. Premiere Cobb held by his mother LaQuanda Cobb. Tom Vesce (Left) next to Premiere Cobb and his mother LaQuanda (right) and Victoria Vesce (Rear) pictured here at the wish granting luncheon near Premiere’s home. The family was greeted by Tom Vesce, his wife Denise and daughter Victoria along with Make A Wish local volunteers Ann Tess and Tamara Ham. All were gathered for a very special luncheon celebration for a Mall Shopping Spree Wish for Premiere and his entire family. Premiere is called “Mir Mir” around his family. He has a condition of cerebral palsy which has left him severely handicapped, nonverbal and in a wheel chair with a feeding pump. Premiere is 10 years old and has a very complex medical history including cerebral palsy, developmental delay, seizure disorder, gastronomy dependence, insufficient weight gain and scoliosis. Premiere lives in Kinston North Carolina and visits East Carolina University Hospital for his care. His favorite color is blue and he loves smurfs. Since 1980, the Make-A-Wish Foundation® has given hope, strength and joy to children with life-threatening medical conditions. From their humble beginnings with one boy’s wish to be a police officer, they have evolved into an organization that grants a child’s wish in the United States every 40 minutes. 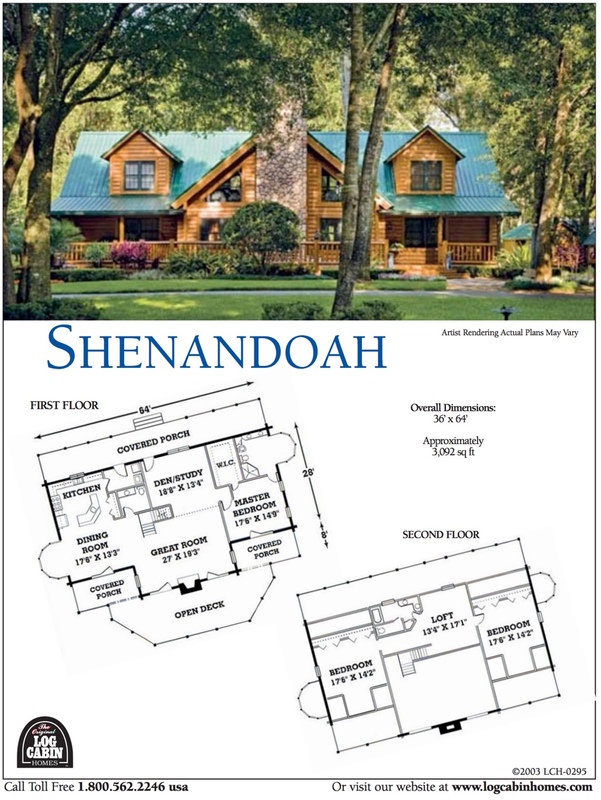 Log Cabin Homes Ltd is a proud Corporate Partner of the Make-A-Wish Foundation of North Carolina. 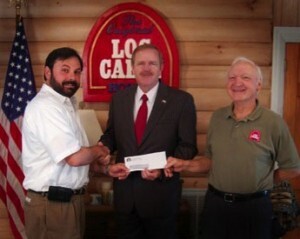 Tom Vesce (Left) presents the company donation to caregiver Richard Vick, Log Cabin Director of Purchasing (Right) to provide Richard “Tyler” (Middle) the opportunity to enjoy Camp Easter Seals Virginia. 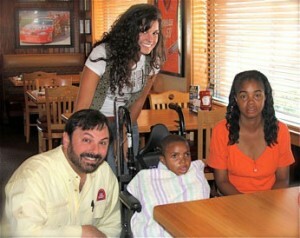 Eighteen year old Richard “Tyler” is afflicted with Cerebral Palsy that requires 24/7 care giver assistance. Tyler sustains himself on a monthly government disability check and Medicaid along with assistance from distant relatives and non-related caregivers such as Log Cabin’s Director of Purchasing Richard Vick and corporate donors like Log Cabin Homes whose financial assistance makes Tyler’s attendance at Camp Easter Seals possible. Camp Easter Seals Virginia is a wonderful camp that provides an accessible environment for children and adults with disabilities. Campers participate in traditional camp activities such as swimming, canoeing, horseback riding, and fishing. 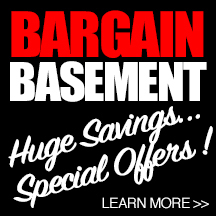 There are also opportunities to practice team building, talent, and leadership skills. The 12 day camp experience allows Tyler to do all of the things he cannot do in the confines of his room and in the ordinary course of his life. Tom Vesce (Left), , presents the company contribution to John Battle (Right), President of the Rocky Mount / Nash Special Olympics. 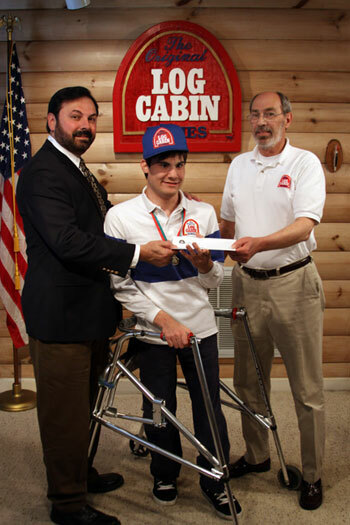 The Original Log Cabin Homes Ltd is proud to be a Bronze Medal Sponsor for the Rocky Mount / Nash Special Olympics. This program provides year-round training and competition for over 250 Rocky Mount & Nash County citizens with mental and physical disabilities. 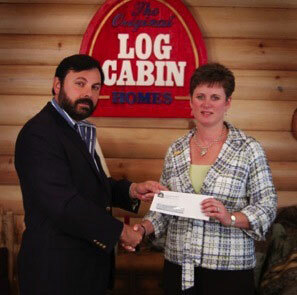 Log Cabin Homes has contributed enough funds to provide the training and support for two local athletes. By becoming a sponsor Log Cabin Homes will provide these two athletes the opportunity to learn, grow, and know the joy of athletic competition. 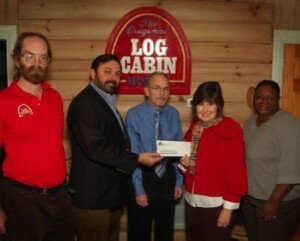 Tom Vesce (Left of Center) and Gene Avery, Treasurer (Center) presents Log Cabin Homes’ financial contribution to the Food Bank of North Carolina to Mary Esther Baker, Area Development Officer (Right of center) and Christy Simmons (Far Right) Manager of Public Relations. Also pictured is Michael Shaw (Far Left) who has been a direct recipient of the Log Cabin Homes “Food-For-Friends” Program. Shortly after that, Michael was offered employment and a place to live by the company. Where is your next meal coming from? Most of us don’t have to worry about where our meals come from. But for almost a half of a million of our neighbors in Central and Eastern North Carolina this is a question that they face every morning and every evening. Its a question that they ask themselves every time they hear their 4 year old daughter cry.. “Mommy, I’m Hungry.” It is especially heartbreaking that one-third of our hungry neighbors are children. It is this question that sparked the compassion of Tom Vesce who quickly offered the financial support of The Original Log Cabin Homes to the Food Bank of Central & Eastern North Carolina. 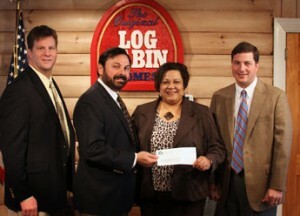 Log Cabin Homes’ contribution provides enough to supply 1,000 nutritious meals to those less fortunate. It is through our support and other supporters like us that we bring comfort and hope to the lives of innocent children, hard-working parents and seniors on fixed incomes. Tom Vesce (Left), presents the company contribution to Mrs. Henrietta Zalkind (Right), The First Executive Director for the Down East Partnership for Children. Log Cabin Homes is proud to support the Down East Partnership for Children and to help the organization with their mission. Our support helps programs that reduce child obesity, Programs that create schools that are supported by local communities, and programs that help families in need not with a hand-out but a hand up. More importantly, our support further enables the Down East Partnership for Children to provide “Every Child” the opportunity to learn, dream, grow and thrive.The mission of Down East Partnership for Children is to improve the quality of life for children and families in Nash & Edgecombe counties in North Carolina through advocating and supporting quality, life-long education and facilitating a trusted and coordinated system of community services. 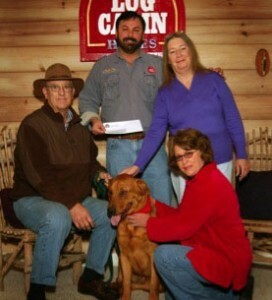 Tom Vesce (Center), and Log Cabin Homes Customer Service Representative Sallie Overton (Right) presents the company’s financial contribution to the Down East Animal Refuge to Graham Whitehead, Founder (Left) and his wife Nancy (Below). Also in the picture is “Chico,” a full bred Labrador who’s life was spared by the good works of the refuge. The mission of Down East Animal Refuge (DEAR) is to improve the conditions and health of animals by rescuing abused, stray and feral animals, promoting humane treatment and responsible pet ownership methodically through education and the law, and fostering compassion for all animals. By contributing to this refuge, The Original Log Cabin Homes and it’s employees help to provide food and veterinarian services for these animals until they can be re-homed. More than 95% of Log Cabin Homes Employees are pet owners with many adopting abused or abandoned animals. Tom Vesce, a dog owner, found compassion for these animals by taking in a stray cat of his own. Sallie Overton volunteers for a feline rescue group and all of her animals are rescued animals! Tom Vesce (Left), presents the company’s financial contribution to the Boys & Girls Club of Nash/Edgecombe Counties. (From Left to Right) Theresa Shaw, Executive Director, Scott Lewis, First South Bank Vice President/City Executive and Chief Volunteer Officer, and Tony Orr, Director of Operations. The Original Log Cabin Homes and it’s employee volunteers are enthusiastic supporters of the good works of the Boys & Girls Clubs of Nash/Edgecombe Counties. The mission of the Boys & Girls Club is to inspire and enable all young people in Nash/Edgecombe Counties of North Carolina to realize their full potential as productive, responsible, and caring citizens. The Boys & Girls Clubs of Nash/Edgecombe Counties serves nearly 6,000 youth in Nash/Edgecombe counties through membership and community outreach activities in 5 area club locations. 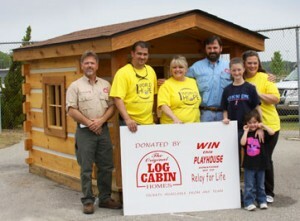 Tom Vesce, and Jeffrey Brooks, Vice President stand in front of the donated Log Cabin Playhouse with the three Co-Chairs of the Nash County Relay for Life Amanda Bell, Shannon Lashley and Stephen Brumfield . 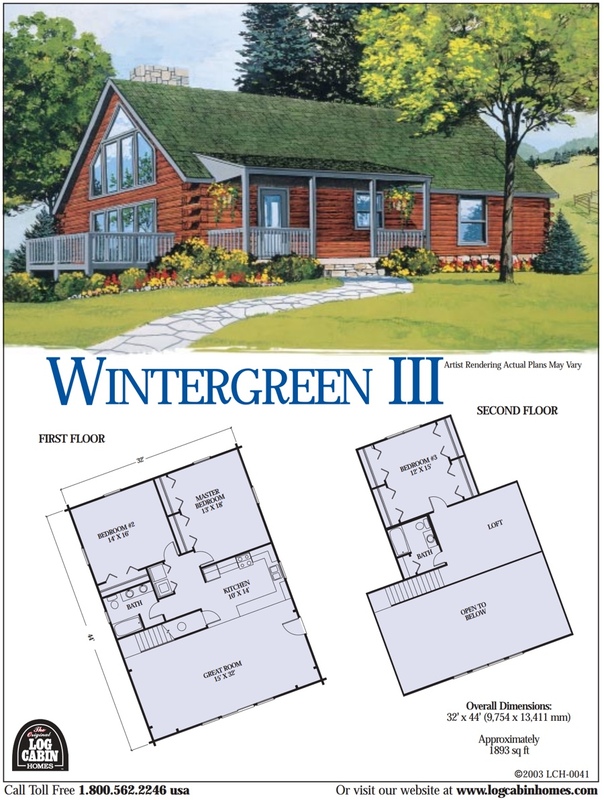 Stephen is also Log Cabin Homes National Sales & Marketing Director. Also pictured here is Stephen’s Daughters Taylor and Addison who also contribute to the event. Mr. Tom Vesce, proudly contributed this fully constructed Log Cabin Playhouse to the Nash County Relay for Life. The Cabin was part of an event wide drawing at the closing ceremonies of the event. Over $10,000 was raised from this donation. 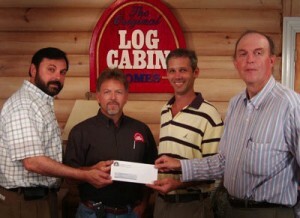 Log Cabin Homes co-sponsored the event on April 23-24, 2010 to help support the fight again cancer. “It is an honor to contribute to this charity, even more of an honor that our employees played such a vital role in this event” said Vesce. Stephen Brumfield, National Sales & Marketing Director served as a Co-Chair for the event. Eric Pate, Operations Audit Manager, served as a committee chair for accounting. Other employees and their families and friends also volunteered for the event by creating a fundraising team of more than 20 members raising several thousand dollars for the cause. Relay For Life is the American Cancer Society’s signature event aimed at raising funds to support research that hopefully one day soon will cure cancer. Other than fundraising, the event proudly honors those who have fought the battle against cancer and won, and remembers those who have fallen to this disease. The Nash County Relay for Life had another record breaking year in 2010 and to date has raised almost $300,000. Tom Vesce (Left), presents the company contribution to Ziva Raney, President and CEO (Right) for the Make A Wish Foundation of North Carolina. 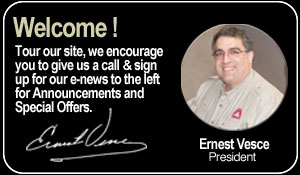 Log Cabin Homes and its employees are very excited to be a part of this organization. Since 1980, the Make-A-Wish Foundation® has given hope, strength and joy to children with life-threatening medical conditions. From their humble beginnings with one boy’s wish to be a police officer, they have evolved into an organization that grants a child’s wish in the United States every 40 minutes. Stephen Brumfield, National Sales Director, enthusiastically volunteers his time to the efforts of this charity and is also a member of the Financial Resource Development Committee. Tom Vesce (Left), presents the company corporate contribution to the American Red Cross to Kristen Ward, Director of Development (Right). 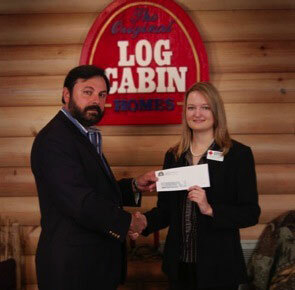 Log Cabin Homes is a supporter of the Frederick E. Turnage Chapter of the American Red Cross. In hurricane-prone Eastern North Carolina, Log Cabin Homes employees volunteer their time to the good works of the American Red Cross. The American Red Cross, a humanitarian organization led by volunteers and the fundamental principles of the International Red Cross Movement, provides relief to victims of disaster and help people prevent, prepare for, and respond to emergencies. The American Red Cross has been service our area since 1917. Tom Vesce and lifetime member of the National Eagle Scout Association (NESA) (Left), presents the company contribution to Mr. Charlie Lewis (Right), Executive Board Member of the East Carolina Council of the Boy Scouts of America. 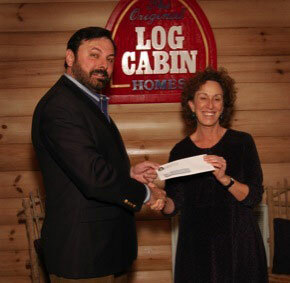 Log Cabin Homes has, for many years, supported the camp program of the East Carolina Council with financial contributions, building materials and log cabin structures. 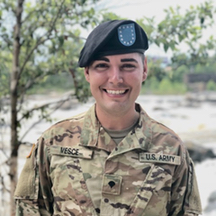 The East Carolina Council has five camps in its service area which includes Camp Charles, Camp Hatcher, Camp Bonner, Camp Boddie and The Pamlico Sea Base. These camps not only support and serve the youth in the various Boy Scout Programs but also serve the handicap and disadvantaged youth in the Eastern North Carolina area. 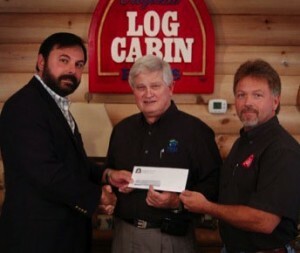 Tom Vesce (Left), presents the companies financial contribution to The Gideons International to Log Cabin Homes Staffers and fellow Gideons. (Left to Right) Jeff Brooks, Sidney Bruton and Emmitt Frazier. The Gideons are an association of inter-denominational christian business and professional men who are an extended missionary arm of local christian churches. Since 1899 The Gideons International have served billions of people the Holy Word of God through the distribution and placement of the Bible in more than 89 languages and to more than 189 countries around the world. The Gideons are best known for their placement of the Bible in hotels and motels around the world. 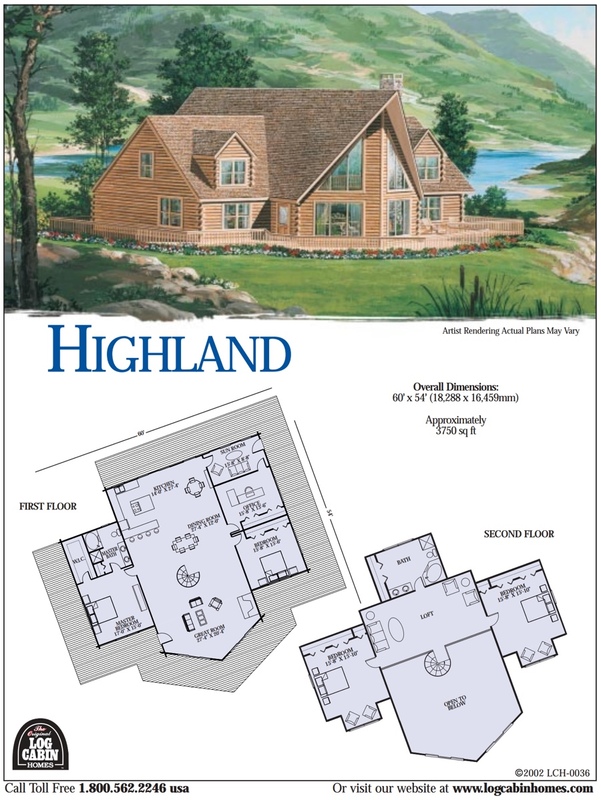 Log Cabin Homes proudly provides financial support as well as lumber and building materials for the Rocky Mount Area Habitat for Humanity. Habitat for Humanity was founded in 1976 and has built or rehabilitated more than 200,000 houses for families in need, becoming a true world leader in addressing the issue of poverty housing. 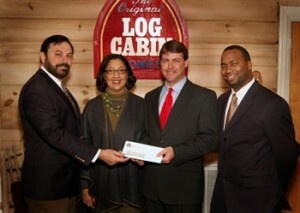 Tom Vesce (Left Center) of The Original Log Cabin Homes, presents the Corporate Contribution to Melanie Meeks (Right Center), Executive Director, Mark Dickinson (Far Left),Chairman of the Board and Lankford Dunton III, Member of the Board of Directors (Far Right) for Communities in Schools of the Rocky Mount Region, Inc.
Log Cabin Homes is proud to sponsor two students in the Rocky Mount area for the Have A Heart for Communities in Schools Campaign. Our contribution will provide a full year of academic support and enrichment opportunities for two Communities In Schools students. The Communities In Schools organization is one of the largest drop-out prevention programs in the country and it relies on the support of companies such as Log Cabin Homes to continue their services! Tom Vesce (Left) and Mr. Jules Springborne, Log Cabin Senior Corporate Sales Representative and World War II Navy Veteran (Right) presents the corporate contribution to Mr. Al Steiner (Center), USO Vice President of Operations. 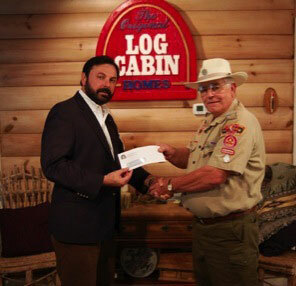 Log Cabin Homes is proud to support the mission of the USO and the United States Military. Since 1941, the USO Mission is to provide support and comfort for active duty and retired American service men/women, reservists, National Guard members, their immediate families, dependents and guests. North Carolina has the largest military population of any state in the country. Military bases in North Carolina include Fort Bragg, Camp Gilbert H. Johnson, Camp Mackall, Camp Davis, Fort Green, Camp Lejeune Marine Corps Base, Marine Corps Air Station at Cherry Point, Marine Corps Air Station at New River, Marine Corps Auxiliary Landing Field, Pope Air Force Base, and Seymour Johnson Air Force Base.. Log Cabin Homes currently employs veterans from World War II, Korea, Vietnam, and both Gulf Wars.